The opinions expressed on this webpage represent those of the individual authors and, unless clearly labeled as such, do not represent the opinions or policies of TBS. When I joined my first archaeological dig at a site near Hadrian’s Wall in 2002, walls never appeared in the nightly news. Britain was still many years away from planning a barrier near the opening of the Chunnel in Calais. Saudi Arabia hadn’t yet encircled itself with high-tech barricades. Israel hadn’t started reinforcing its Gaza border fence with concrete. Kenya wasn’t seeking Israel’s help in the construction of a 440-mile barrier against Somalia. And the idea that India might someday send workers high into the Himalayas to construct border walls that look down on clouds still seemed as preposterous as the notion that Ecuador might commence construction on a 950-mile concrete wall along its border with Peru. No one chatted about walls while we cut through sod to expose the buried remains of an ancient fortress in northern Britain. I doubt that anyone was chatting about walls anywhere. The old fortress, on the other hand, was generally considered the crown jewel of British archaeology. For more than 30 years, sharp-eyed excavators at the Roman fort of Vindolanda had been finding writing tablets — thin slivers of wood upon which Roman soldiers had written letters, duty rosters, inventories, and other assorted jottings. At first, the tablets had represented something of a technical challenge; their spectral writing faded almost immediately upon exposure to air, almost as if written in invisible ink. But when the writings were recovered through infrared photography, a tremendous satisfaction came from the discovery that Roman soldiers complained about shortages of beer while the wives of their commanders planned birthday parties. The Romans, it turned out, were a lot like us. Archaeology, even at such a special place, was tiring business, but after work I enjoyed taking hikes along the wall. It was beautiful countryside — well lit by an evening sun that lingered late during the Northumbrian summer — and as I ambled over the grassy hills, occasionally enjoying the company of sheep, I sometimes imagined I was a lonely Roman soldier, stationed at the end of the world, scanning the horizon for barbarians while I awaited a resupply of beer. I’m ashamed to say that I took no detailed notes on the wall itself. It made for beautiful photographs, the way it stretched languidly over the countryside, but my real interest lay in other things: the Roman soldiers, the barbarians, the letters. If anything I saw in Britain was to hold any significance for my research, it seemed obvious that I would find it in the wet gray clay of Vindolanda. There I hoped only to discern tiny clues about a particular period of Roman history. Such are the modest goals of the academic. For the duration of my stay, my focus was on the clay. All the while, I was standing right next to a piece of a much bigger story, a fragment of the past that was about to rise up from its ancient slumber to dominate contemporary politics on two continents. I was leaning against it, resting my hand on it, posing for pictures by it. I just didn’t see it. It was my interest in the barbarians that finally opened my eyes to the historical importance of walls. The barbarians were, in the main, inhabitants of every North African or Eurasian wasteland — the steppes, the deserts, the mountains. Civilized folk had erected barriers to exclude them in an astonishing array of countries: Iraq, Syria, Egypt, Iran, Greece, Turkey, Bulgaria, Romania, Ukraine, Russia, Britain, Algeria, Libya, Azerbaijan, Uzbekistan, Afghanistan, Peru, China, and Korea, to give only a partial list. Yet somehow this fact had entirely escaped the notice of historians. 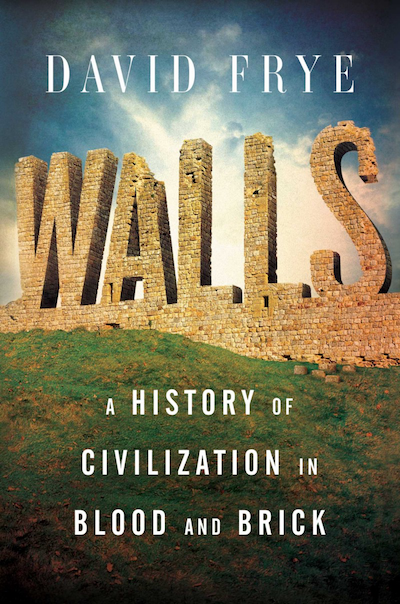 Not a single textbook observed the nearly universal correlation between civilization and walls. It remained standard even for specialists to remark that walls were somehow unique to Chinese history, if not unique to Chinese culture — a stereotype that couldn’t possibly be any less true. By some cruel irony, the mere concept of walls now divides people more thoroughly than any structure of brick or stone. The reemergence of border walls in contemporary political debates made for an even more surprising revelation. Like most people my age, I had watched the fall of the Berlin Wall in 1989 with great excitement. To many of us, it looked like the beginning of a new era, heralded by no less towering an international figure than David Hasselhoff, whose concert united both halves of Berlin in inexplicable rapture. More than a quarter-century has passed since then, and if it had once seemed that walls had become a thing of the past, that belief has proven sorely wrong. Border walls have experienced a conspicuous revival in the 21st century. Worldwide, some 70 barriers of various sorts currently stand guard. Some exist to prevent terrorism, others as obstacles to mass migration or the flow of illegal drugs. Nearly all mark national borders. By some cruel irony, the mere concept of walls now divides people more thoroughly than any structure of brick or stone. For every person who sees a wall as an act of oppression, there is always another urging the construction of newer, higher, and longer barriers. The two sides hardly speak to each other. As things turned out, it was the not the beer or the birthday parties that connected the past to the present in northern England. It was the wall. We can almost imagine it now as a great stone timeline, inhabited on one end by ancients, on the other by moderns, but with both always residing on the same side facing off against an unseen enemy. If I couldn’t see that in 2002, it was only because we were then still living in an anomalous stage in history and had somehow lost our instinct for something that has nearly always been a part of our world. How important have walls been in the history of civilization? Few civilized peoples have ever lived outside them. As early as the 10th millennium BC, the builders of Jericho encircled their city, the world’s first, with a rampart. Over time, urbanism and agriculture spread from Jericho and the Levant into new territories: Anatolia, Egypt, Mesopotamia, the Balkans, and beyond. Walls inevitably followed. Everywhere farmers settled, they fortified their villages. They chose elevated sites and dug ditches to enclose their homes. Entire communities pitched in to make their villages secure. A survey of prehistoric Transylvanian farming villages determined that some 1,400 to 1,500 cubic meters of earth typically had to be moved just to create an encircling ditch — an effort that would have required the labor of 60 men for 40 days. Subsequently, those ditches were lined with stone and bolstered by palisades. If a community survived long enough, it might add flanking towers. These were the first steps toward walls. The creators of the first civilizations descended from generations of wall builders. They used their newfound advantages in organization and numbers to build bigger walls. More than a few still survive. We can estimate their heights, their thicknesses, their volumes, and their lengths. But the numbers can only tell us so much. We will always learn more by examining the people who built the walls or the fear that led to their construction. And what about these fears? Were civilizations — and walls — created only by unusually fearful peoples? Or did creating civilization cause people to become fearful? Such questions turn out to be far more important than we’ve ever realized. Since 2002, I’ve had ample time to reflect on the Roman soldiers who once guarded Hadrian’s Wall. They certainly never struck me as afraid of anything. Then again, they weren’t exactly Roman, either. They came chiefly from foreign lands, principally Belgium and Holland, which were in those days still as uncivilized as the regions north of the wall. Everything they knew of building and writing, they had learned in the service of Rome. As for the Romans, they preferred to let others fight their battles. They had become the definitive bearers of civilization and as such were the target of a familiar complaint: that they had lost their edge. Comfortable behind their city walls and their foreign guards, they had grown soft. They were politicians and philosophers, bread makers and blacksmiths, anything but fighters. The Roman poet Ovid knew a thing or two about the soft life, but he also had the unusual experience of learning what life was like for Rome’s frontier troops. The latter misfortune came as a consequence of his having offended the emperor Augustus. The offense was some peccadillo — Ovid never divulges the details — compounded by his having penned a rather scandalous book on the art of seduction. “What is the theme of my song?” he asked puckishly, in verse. “Nothing that’s very far wrong.” Augustus disagreed. Reading Ovid’s little love manual, the moralistic emperor saw plenty of wrong. He probably never even made it to the section where Ovid raved about what a great ruler he was. Augustus banished the poet from Rome, exiling him to Tomis, a doomed city on the coast of the Black Sea, 60-odd miles south of the Danube. Tomis was a hardscrabble sort of place, a former Greek colony already some 600 years old by the time of Ovid’s exile in the first century AD and no shinier for the wear. Its distinguishing characteristics were exactly two: First, it was about as far from Rome as one could be sent. Second, it lay perilously close to some of Rome’s fiercest enemies, in an area that didn’t yet have a border wall. Like northern Britain, the region of Tomis would one day receive its share of border walls, but in Ovid’s day, the only barriers to invasion were the fortifications around the city itself. Ovid suffered in his new home. It was one thing to live in a walled city, but quite another to be completely confined within those walls. In his letters to Rome, Ovid complained that the farmers of Tomis couldn’t even venture out onto their fields. On the rare occasion when a peasant dared to visit his plot, he guided the plow with one hand while carrying weapons in another. Even the shepherds wore helmets. Fear permeated everyday life in Tomis. Even in times of peace, wrote Ovid, the dread of war loomed. The city was, for all intents and purposes, under perpetual siege. Ovid likened the townspeople to a timid stag caught by bears or a lamb surrounded by wolves. Occasionally, Ovid reminisced on his former life in the capital, where he’d lived free from fear. He wistfully recalled the amenities of Rome — the forums, the temples, and the marble theaters; the porticoes, gardens, pools, and canals; above all, the cornucopia of literature at hand. The contrast with his new circumstances was complete. At Tomis, there was nothing but the clash and clang of weapons. Ovid imagined that he might at least content himself with gardening, if only he weren’t afraid to step outside. The enemy was quite literally at the gates, separated only by the thickness of the city’s wall. Barbarian horsemen circled Tomis. Their deadly arrows, which Ovid unfailingly reminds us had been dipped in snake venom, made pincushions of the roofs in the city. The birth of walls set human societies on divergent paths, one leading to self-indulgent poetry, the other to taciturn militarism. There remained a final indignity for Ovid: the feeble, middle-aged author was pressed into service in defense of Tomis. As a youth, Ovid had avoided military service. There was no shame for shirkers back in Rome, a city replete with peaceniks and civilians. Now aging, Ovid had finally been forced to carry a sword, shield, and helmet. When the guard from the lookout signaled a raid, the poet donned his armor with shaking hands. Here was a true Roman, afraid to step out from behind his fortifications and hopelessly overwhelmed by the responsibility of defending them. From time to time, a Chinese poet would find himself in a situation much like Ovid’s. Stationed at some lonely outpost on the farthest reaches of the empire, the Chinese, too, longed for home while dreading the nearness of the barbarians. “In the frontier towns, you will have sad dreams at night,” wrote one. “Who wants to hear the barbarian pipe played to the moon?” Sometimes they meditated on the story of the Chinese princess who drowned herself in a river rather than cross beyond the wall. Even Chinese generals lamented the frontier life. Oddly, none of these sentiments appear in the letters written by the Roman soldiers at Vindolanda. Transplanted to a rainy land far from home, they grumbled at times about the beer supply but had nothing to say about shaky hands or sad dreams. It was as if these barbarian-turned-Roman auxiliaries had come from another world, where homesickness and fear had been banished. Perhaps they had. The collapse of those walls influenced world history almost as profoundly as their creation, by leading to the eclipse of one region, the stagnation of another, and the rise of a third. When the great border walls were gone, leaving only faint traces on the landscape, they left indelible lines on our maps — lines that have even today not yet been obscured by modern wars or the jockeying of nations for resources. Today, a newer set of walls, rising up on four continents, has the potential to remake the world yet again. Excerpted from WALLS by David Frye. Copyright © 2018 by David Frye. Excerpted with permission by Scribner, a Division of Simon & Schuster, Inc.
David Frye is the author of Walls: A History of Civilization in Blood and Brick. He received his PhD in history from Duke University. The Key to Cracking Long-dead Languages?